Paris (AFP) - French President Emmanuel Macron appointed his first cabinet on Wednesday mixing Socialists, centrists and rightwingers with newcomers to politics as he pressed ahead with plans to create a broad governing coalition. The new cabinet of 22 people meets campaign pledges of being smaller than its predecessors and having gender parity, with European lawmaker Sylvie Goulard landing the prestigious defence portfolio. She will take over from veteran Socialist Jean-Yves Le Drian who will move over to foreign affairs, while rightwinger Bruno Le Maire was appointed economy minister. Other key figures instrumental in Macron's sensational victory in this month's election were given senior roles, with the Socialist mayor of Lyon, Gerard Collomb, named as interior minister while centrist ally Francois Bayrou becomes justice minister. Macron and his centre-right prime minister Edouard Philippe faced a tricky balancing act in choosing their first government, with 39-year-old Macron needing to keep his allies happy while opening up positions to Philippe's rightwing Republicans party. France's youngest ever president wants to create a new centrist force in French politics -- at the expense of the traditional Socialist and Republicans parties -- which will be put to the test in parliamentary elections next month. Without a parliamentary majority, he will find it hard to push through his ambitious plans to loosen France's strict labour laws, boost entrepreneurship and reduce class sizes in tough neighbourhoods. His appointment of Le Maire as economy minister and fellow Republicans MP Gerald Darmanin as public accounts minister was seen as an attempt to neuter his right-wing opponents, still reeling from their defeat in the presidential vote. 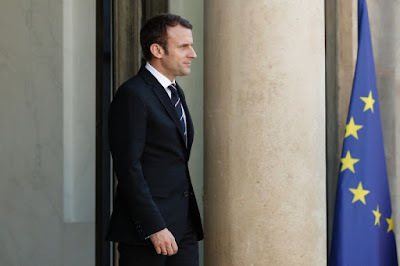 Republicans secretary general, Bernard Accoyer, said Le Maire and Darmanin had been excluded from the party for accepting Macron's outstretched hand and accused Macron of trying to "sew up the democratic debate" by poaching from his rivals. In the opposite camp, the Socialists have shown greater readiness to work with Macron, who quit the departing Socialist government to run for president. But Le Drian was one of only two outgoing ministers to be kept on, reflecting Macron's desire for a fresh approach. Besides seasoned politicians, his team features several new faces drawn from the sports, arts and NGO worlds. Olympic fencing champion Laura Flessel was named sports minister, star environmentalist Nicolas Hulot -- who had spurned multiple offers of cabinet roles from previous presidents -- accepted the ecology brief and crusading publisher Francoise Nyssen took charge of culture. The health, education and transport portfolios also went to newcomers, all of them experts in their field. The far-right National Front dismissed the changes as window-dressing, accusing Macron of "recycling" politicians from the mainstream left and right. The announcement of the line-up was delayed by 24 hours on Tuesday, with the presidency saying it needed more time to carry out more extensive screening of candidates. Macron has promised a new law introducing higher ethical standards for lawmakers as one of his first pieces of legislation and was keen to avoid possible embarrassments, aides said. Former president Francois Hollande was left red-faced by revelations in 2012 that his budget minister Jerome Cahuzac, a plastic surgeon, had a bank account in Switzerland where he had hidden income from tax authorities. In his busy first week, Macron is also set to meet EU Council President Donald Tusk in Paris later Wednesday as he tackles his top foreign priority of reforming the European Union. Tusk was one of the first prominent European voices to congratulate Macron on his May 7 presidential election runoff victory over far-right and anti-EU politician Marine Le Pen. Macron, who ran a staunchly pro-European campaign, kept with tradition by visiting German Chancellor Angela Merkel on Monday in his first trip abroad after taking office. The pair now at the centre of the European project vowed to give it new impetus, saying they were ready to change treaties if necessary. Macron has urged a deepening of the EU to fight off a recent surge of populism on the continent.